It’s been quite a while since I’ve painted on canvas! I’ve painted several murals and a bunch of vinyl records over the past few months. I guess it’s about time. This new painting in progress is a special project for the latest Sunlight CD cover art. Aaron (my hubby and music partner), had the inspiration for it. Every once in a while he has a great idea! 😉 😉 The title of the album is “Shuffle” and the painting is based on the four seasons. I guess it’s a play on our Sunlight tag line, “Sunlight shines on it all”, and the fact that the sun shines through all four seasons. This is a new concept for me as I’ve never really painted a mandala in sections like this. I’m having a difficult time keeping it round. Usually, my freehand form of painting is easy to keep round, but with the different sections, not so much. Good news is, this is just the background of the painting. Not exactly sure where it’s going. The muse guides me and tells me what’s next. I just follow the silent cues. The finished painting hasn’t quite revealed itself to me, just yet. Follow me on Instagram if you want to continue seeing the progress. Speaking of Sunlight, we have just released our first single (Pale Moonlight), from the new CD, which should be released in full at the beginning of 2018. We are really excited about this album as we played with a drummer and bass player. The first CD was mainly acoustic, with guitar and ukelele. We had one song we added drums to, and after that one song, we decided to record the entire 2nd CD with a full band. Plus, I played uke on this one! Have a listen and let me know what you think? Thanks! Summer is Almost Here, 12 x 12" oil on canvas, starting bid $9.99! When I first started selling my art online, way back when in 1999, I sold exclusively on Ebay. I sold on Ebay for about 3 years. Then I found Etsy and moved everything there. So, here it is, almost 12 years later and I am missing the excitement of the auction style sales. Because I love to give my collectors and fans good deals every once in awhile, I have decided to get back into the auctions. Every week I will list one original painting for sale, auction style, with a starting bid of $9.99. I will vary the size of painting, the style of painting, so you never know what you may get! 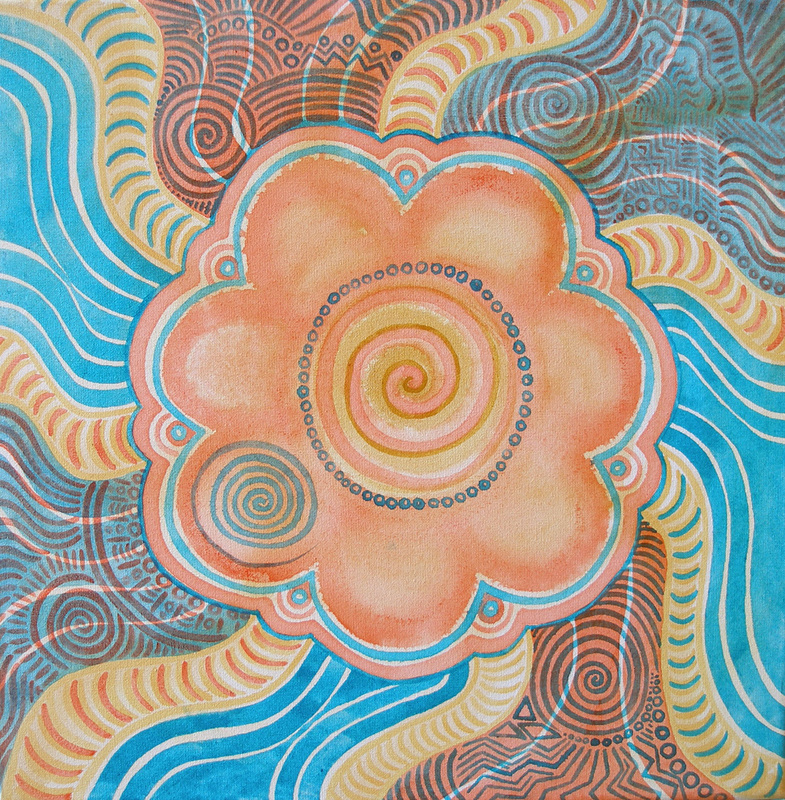 This week’s painting was done in 2007 and is a part of my Spiral Abstract series. “Summer is Almost Here” is a 12 x 12″ oil painting on canvas with a retail value of $300! The previous link will take you directly to the auction page. These will be 7 day auctions, so you have plenty of time to go back and think about your bids! Hope you will find something you LOVE!